Artillery. The first cannon appeared on Ukrainian territories in 1394 in Lviv. By 1468 a foundry had been established there, and it produced guns for all Ukraine. At the time artillery was used for fortifications; field artillery was produced later. The Cossack host began to use artillery in 1580, mainly in the Zaporizhia. Bohdan Khmelnytsky's troops used over one hundred guns in the Battle of Berestechko. Under Hetman Ivan Mazepa, who studied in Holland as a young man, the artillery was greatly improved. It was directed by the Saxon engineer F. von Königsek. Among the master smiths who cast guns the military casters Y. and K. Balashevych were renowned. In 1708 Aleksandr Menshikov captured over 70 cannons in Baturyn, and Peter I confiscated the rest after the Battle of Poltava in 1709. Hetmans Danylo Apostol and Kyrylo Rozumovsky rebuilt the Cossack artillery, but it never attained the strength it had under Mazepa. 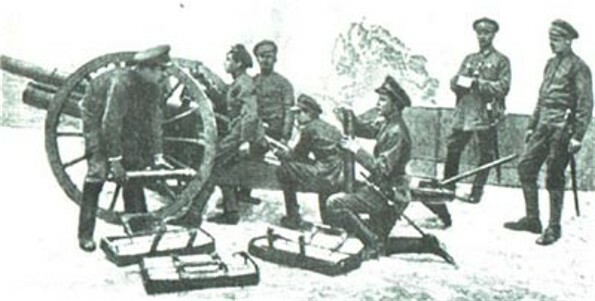 Artillery played an important role in the Ukrainian armies during the struggle for national independence (1917–20). In the Army of the Ukrainian National Republic the Zaporozhian Corps and the Sich Riflemen had complete artillery units, with 180 cannons between them. Other formations of the Ukrainian army had smaller artillery units. In general there was a shortage of cannons, munition wagons, and carriages. The Ukrainian Galician Army had 12 artillery regiments, which had 40 light batteries, 1 mountain and 1 cavalry battery, 6 light howitzer (10 cm) batteries, 172 cannons, and 1 battery of long-range (122 mm) mortars. The joint armed forces that marched on Kyiv in August 1919 had among their artillery units 321 light and 37 heavy cannons as well as the guns on armored railway cars and the guns assigned to infantry and cavalry regiments.